Two years ago on the first Vietnam Motorbike Tours/Cycle Torque combined tour we rode essentially from Nha Trang on the coast up through Dalat and Lake Lak on our way to Da Nang, a former popular R&R spot for American and Aussie soldiers during the Vietnam war. This time we would be starting off from just south of Da Nang, at a seaside resort town called Hoi An. This is a place very popular with tourists from many countries, including France and Russia. We know Bali is a hot spot for Australian tourists and it seems Vietnam is the same for Frogs and Ruskies. All of our group, close to 30, had flown into Da Nang from various places in Vietnam, some choosing to spend some time in the country prior to our tour, and some planning to do the same after the tour. But we were all raring to go for our first day which consisted of a 2-3 hour ride around Hoi An itself. In 2013 Hoi An was given a hard time by the same cyclone which badly damaged much of the Phillipines coast, but it was hard to really tell, as life goes on and people rebuild. Hoi An is also known for its marble sculptures and we ended up calling in to a massive shop where everything from life sized marble tigers to happy Buddhas you could fit in your hand were for sale. My mistake was showing interest in some of the sculptures, which to be honest were very very beautiful. The next thing you know I’m buying a sculpture which resembled a smaller and deformed version of something from Easter Island. That said, I did find it very beautiful, and it has made an excellent wedding anniversary present for my wife. I did get a happy Buddha for free though. Cycle Torque publisher Nigel Paterson and I were used to the intricacies of the Vietnam traffic system from our last tour but you could see on the eyes of most of the tour group, of which about a third were two-up, it was a bit of a shock to the system. There were a couple of returnees, like Greg, Mark and Therese, so they knew what to expect, but the others… But after day one there were no people throwing their hands up saying they couldn’t continue, so it all looked good. 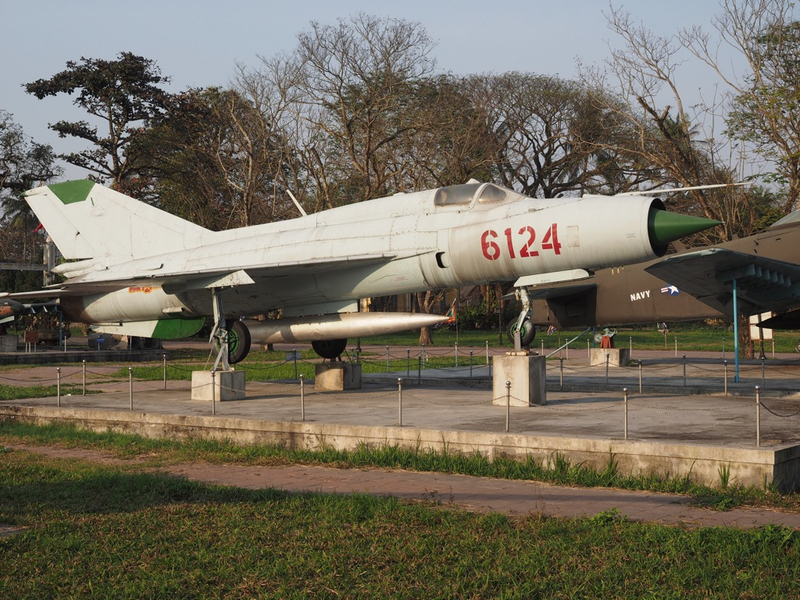 The headline act of this particular tour was the Western Ho Chi Min Trail, which we were following as close as possible within the restrictions of modern day Vietnam and Laos. The Ho Chi Min Trail was named after the then North Vietnamese leader, and ran from north to south, with much of it actually in the neighbouring countries of Laos and Cambodia. 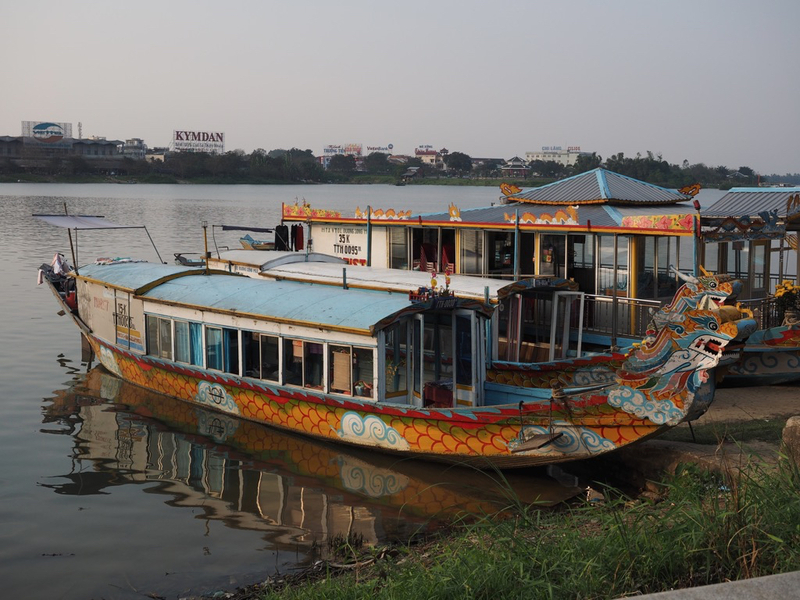 It was used to ferry armaments and supplies to North Vietnamese and Viet Cong troops during the Vietnam war. Day two saw us leave the picturesque Hoi An and head to A Luoi which is situated pretty close to the Laos border. I find the Vietnam road system very much like Eastern Europe. Unlike in western countries where towns have lots of streets, and then a road to the next town, and so on. 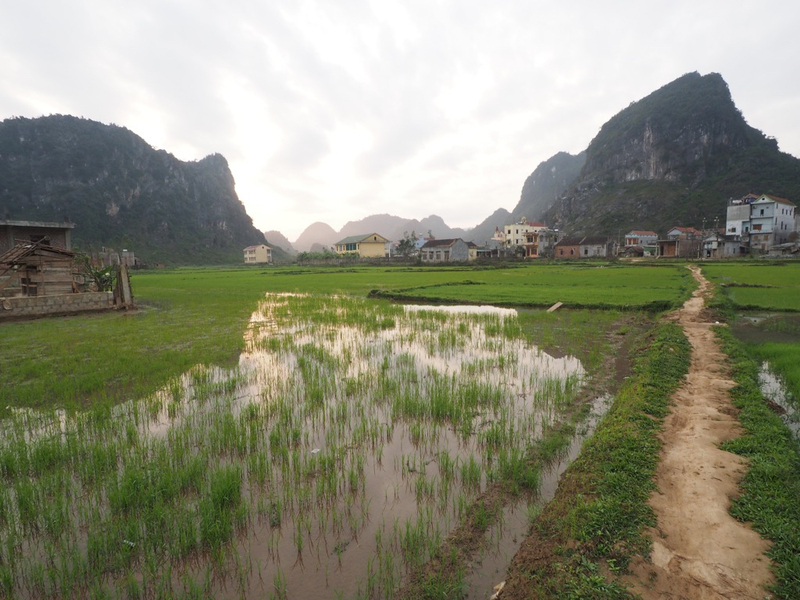 In Vietnam and Eastern Europe the town just doesn’t seem to end, with most houses built on the side of the road, and the rest of the land given to farming. This is in regional areas, and of course major towns and cities are much bigger. You could ride for 30-40 kilometres with houses side by side the whole way. Another thing which takes some getting used to is the lower speeds of the traffic. Doing 300 kilometres in Vietnam is like doing 700 in Australia, because the motorcycles are limited to 175cc, so 80 km/h is cracking along. I reckon you would average 50km/h-60 km/h with minimal traffic, much less with heavy traffic. Day two was a bit over 200 kilometres, and getting to our digs at A Luoi saw everyone adjourn to the dining room where more than a smidgen of beer and bourbon was drunk. You see alcohol is much cheaper in Vietnam than here so budget issues were the last thing on our mind as we partied on, and it seemed a precedent had been set for the rest of the tour. Compared to our last trip the roads were certainly more remote, and so were the towns. And the time coincided with Tet, the Lunar New Year in Vietnam which is a massive celebration. Most people were on holidays and shops closed. On the last trip we would all just find a decent restaurant but this time there were less options available. But Jason and the guides, Bau, JJ and TT know their stuff and had us in the best accommodation available, and us eating the best food available. It was all good from our point of view, as we were all there to sample a different culture and food. From here it was off to Khe Sanh, about 140 kilometres further north. The road basically hugs the Laos border and to be honest it felt a bit surreal seeing the road signs showing Khe Sanh, as many of my era grew up listening to Cold Chisel’s Khe Sanh on the radio or in nightclubs. It’s a much bigger town than A Luoi, and an easy ride too. Once at our motel we quickly dropped our kit and headed out to an old American air base which is now a war museum, with numerous relics on display, mainly captured US aircraft and tanks. The battle of Khe Sanh raged between American/South Vietnamese and North Vietnamese troops from January 21 and July 9, 1968. During the battle, a massive aerial bombardment campaign (Operation Niagara) was launched by the US Air Force to support the US base. Over 100,000 tons of bombs (equivalent in destructive force to five Hiroshima-size atomic bombs) were dropped until mid April by aircraft of the U.S. Air Force, Navy, and Marines onto the surrounding areas of Khe Sanh. The US troops were very much under siege and at the time it was deemed the most dangerous place a US soldier could be by the American press. Eventually relief soldiers got through to the base, but not long after the new American commander in Vietnam decided to dismantle the base rather than risk similar battles in the future. It was eventually captured by NVA troops on July 9. According to our guides the surrounding hills were once thick jungle. Now the only plant which can grow beyond a small shrub is the hardy Australian Eucalyptus tree, as the poison nicknamed Agent Orange was used to defoliate large areas surrounding Khe Sanh and still affects the area to a degree, even after 40 odd years. An amazing place, and we even stopped off at a scrap metal merchant who had old bomb casings and shrapnel. The war, while so long ago is still visually recognisable, with old tanks converted to bulldozers, old Russian trucks, and monuments not uncommon. It is even a source of income for some Vietnamese people who dig for scrap war metal in the hills. At A Luoi Nigel was even called into a house by a former NVA soldier who noticed him taking photos at dawn, just to have a chat. People move on from hardships, and Pete, one of the group, took a tour through the museum in Ho Chi Min (formerly Saigon) where the young female guide said, “we will never forgive and never forget, we have just moved on.” Like any story there’s always two sides. One thing is for sure though, the overriding feeling is of friendliness from the Vietnamese people. Khe Sanh was pretty epic for me. Having grown up with the Cold Chisel song of the same name it was almost like a homecoming of some sort for me at least. From here we would undertake one of the most amazing motorcycle journeys I, and I’m sure most of the other tour participants, had ever done. Around 260 kilometres and 7000 corners of some of the most isolated roads in the world, and that was just for that day. The road north from Khe Sanh to the World Heritage area of Phong Nha runs very close to the Laos border and the scenery is simply amazing. Everything from low lying farmland to mountain peaks shrouded in mist, and the odd rainforest or 20 thrown in for good measure. The population along the Western Ho Chi Minh trail is small in numbers, and much of it are what Vietnamese people term as ethnic minorities or minority people. Most of the population is made up of Kinh (Viet) ethnicity but generally speaking most of these people live in the cities or relatively close to them. In rural areas the minority groups even have vastly different dialects. 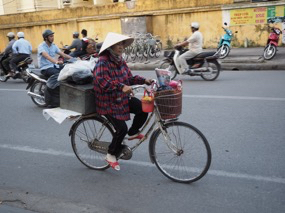 As Vietnam is considered a third world country it’s easy to think the road system would be very basic. In fact this is far from the truth. Sure there is not kilometre after kilometre of freeway but the road from Khe Sanh to Phong Nha is pretty much all concrete and aside from the odd section of road works here and there the condition of the road is quite good. And because it’s in such an isolated area there is basically no traffic to speak of. We were given a heads up not to ride too fast though as getting medical help out there was never going to be a speedy process. The 150cc Lifan cruisers were the go too. Riding a bike that is too much bigger would just have got you into trouble I thought. The temptation to go too fast for the road would have been hard to resist. It was fun getting the most out of the bikes and speeds up to 90km/h were touched on a few occasions by the more adventurous of the group. I stopped to take some photos on one occasion on a mountain pass and while trying to catch up with the group in front of me found myself in very misty conditions. Visibility was very limited and I rode on like this for seemingly ages. At one stage I thought I had taken the wrong road then I realised there was only one road to take. I eventually caught up after around 45 minutes but that particular part of the ride was special for me. Just myself and the bike in such conditions allowed my brain to ‘take five’ so to speak. It will stay with me for a long time. To save time our guides brought lunch along for us and each day we would stop in some little village for a Vietnamese coffee and rolls with local produce and fruit. I found it fantastic and better than stopping at restaurants along the way like we had done on the previous tour. The food does vary depending on where you are but just because you are in a decent sized town does not mean the food will be better. Generally speaking though the food is good and cheap. Alcohol is also cheap, and this led to sore heads on more than one occasion. After arriving at Phong Nha we were all ready for a rest. Nigel and some of the group found a fantastic restaurant near the hotel while others were happy enough to have dinner where we were staying while overlooking the river. The next day we took a boat ride from right near our digs to check out the world famous caves. The cool thing is you take the boat right into the cave itself. No engines, just the ferryman pushing the decent sized boat through the cave with his massive paddle. Peaceful and beautiful. After lunch some of us decided to take a 30 minute ride out to another cave system. This is one of the largest caves in the world but it required a lengthy uphill walk to get to the start of it. And seeing it was a trifle humid it was a bit of a workout for us intrepid cave dwellers. Once again, inside the cave was amazing and well worth the effort. At least going back down the thousands of steps was easier than going up. I mentioned earlier the cheap price of food and alcohol. Well our last night in Phong Nha involved copious amounts of both. Bourbon, scotch and numerous flaming B52 cocktail shots had more than a few of us (me mostly) somewhat under the weather the next day. And as we were heading back down that same stretch of 260 kilometre/7000 corners Western Ho Chi Minh Trail there was a certain amount of trepidation on my part. After a few hours though I was feeling okay, all right enough to do a spot of filming for Cycle Torque’s short video of the tour. Nigel and I were wrapping this up when we were approached by a Honda step thru mounted police officer. By this time the rest of the group had left us as we said we would catch up at the lunch stop, about one hour’s ride further down the trail. So here we were, alone and in trouble with the local cops. To be fair he was quite pleasant but was obviously concerned we were filming something we shouldn’t be. After he called for backup on his mobile phone and plenty of hand signals it was obvious he wanted us to follow him to the local police station. Somehow we managed to get him between us but as we entered the next village I cruised past him, gave him a wave, moved up beside Nigel and said, “give it the berries mate, we are out of here.” I had no desire to be questioned by local authorities over some sort of espionage crime. This was the thought in my mind, and most likely far from reality but I didn’t want to stay and find out. My other thought was, as we had the little Lifans pushing 100km/h was that if he could catch us then he deserved to have us. Let’s just say he didn’t catch us. When we finally joined the rest of the group for lunch and a swim in the river some way down the road we were more than a tad relieved. In both tours this was the first and only time the police took any interest in us. Later that day we arrived back again in Khe Sanh where the beds were hard – next time I’m bringing an inflatable mattress. 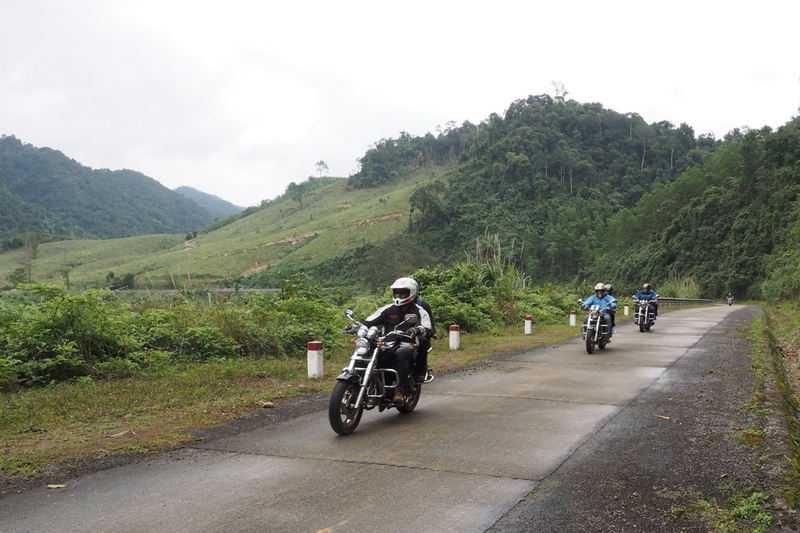 The next day the ride out of Khe Sanh to the old imperial city of Hue started with a great downhill run off the mountain. Traffic was certainly heavier but as it was still the Tet Lunar New Year celebrations the traffic was much lighter than usual. When we arrived at Dong Ha we entered the main highway which basically runs north/south. It’s called the Highway of Death as a bit of a joke, but you can see why it gets its name. With fast moving buses and heavy vehicles galore it’s definitely a case of the biggest vehicle has right of way. Like any sort of busy road though, keep your wits about you and be aware you are in another country and you will be fine. I never saw one accident while I was there, even though the traffic numbers (mainly small motorcycles though) dwarf those of ours here in Australia. We had a pretty big group too, so keeping us all together was not so easy for our guides. It all came good though, even though going is slow on this highway, and we arrived around lunchtime at the city of Hue. Our accommodation here was very good and the city and surrounds very pretty. As it was a free afternoon some went shopping, some walked the streets and some slept, like I did. There is a huge imperial palace in Hue. Much of it was bombed during the war, and as this area was aligned with South Vietnam during the war it was left to deteriorate after Ho Chi Minh and the communists took control after the war. In recent times those thoughts have changed and now much of the walled imperial city is being restored. It is a popular tourist attraction, and rightly so, it is impressive and well worth a visit. 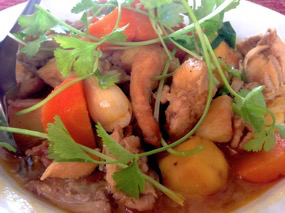 The city itself has lots of fine restaurants and nightlife so there’s something for everyone in Hue. Our last day was a shortish run down to Da Nang but not before we did another mountain pass which gave us a great view of the South China Sea along the way. Arriving at Da Nang railway station it was time to hand the bikes over. As soon as we stepped off the bikes an army of workers emptied the fuel and started crating them for the trip back to Nha Trang on the train. Like last time this was where our group broke. Some were staying on in Vietnam while a few of us were heading straight back to Australia. One thing we all had in common was the wide smiles we wore.